RehaBite® is an innovative training device for home treatment and rehabilitation of muscle pain in the masticatory system. 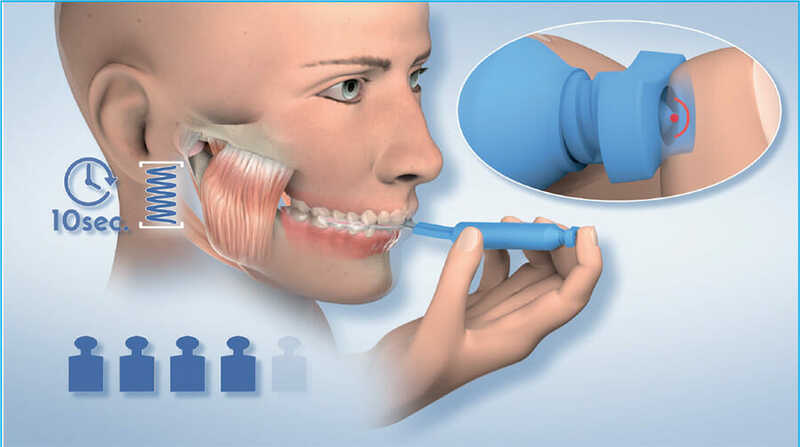 The elastic glycerin-filled bite fork is made of a non toxic flexible plastic material. A major breakthrough is the haptic force control based on the hydrostatic principle. RehaBite® is the first training device that allows force-controlled intraoral coordinative training under reproducible training conditions. This is achieved with the aid of a hydrostatic system, comparable to balancing on a see-saw. Recent scientific studies have demonstrated that the masticatory muscles can be trained very effectively, particularly with coordinative exercises at a submaximal force level. The coordinative training leads to changes in the functional patterns of the muscles that are permanent and outlast the training units. This effect is accompanied by desired structural modifications of specific regions of the brain. The muscular adaptations induced by the training are an essential effect in successful muscle pain treatment. Other therapeutic effects of RehaBite® include postisometric relaxation (i.e. therapeutically effective relaxation of the muscles after previous tension) and haptic control that works like biofeedback (perception of the muscle function through the finger feedback provided by the RehaBite® device). Comparable forms of all these elements can also be found in contemporary physiotherapeutic concepts. The fluid based elastically deformable bite pads of the bite fork are connected to the mechanical components of the hydrostatic system. Biting on the elastic bite fork applies an impact of force to the liquid in the closed hydrostatic system. This force is transmitted to a mobile piston connected with a mechanical spring. The mobile piston can move up and down in front handle. The tip of the piston can be sensed with the fingertip at the front end of the handle. The RehaBite allows five levels of intensity, which can be adjusted with the integrated force control screw at the front end of the handle. This patented hydrostatic system allows haptic control of forces in all levels of intensity. During the training, the finger tip rests on the front end of the handle force control screw. When the piston touches the finger the preset training intensity is achieved (finger feedback). The maximum training intensity is limited to two full turns of the force control screw and can not be exceeded by manipulating or over-twisting the screw by force. RehaBite® is perfectly suited as a therapeutic option of prevention after the acute symptoms have subsided. It is recommended to perform home exercises with the RehaBite® device as a complement of physiotherapeutic and/or dental treatment. The RehaBite® training allows treatment at any time and any place with minimal effort, i.e. it does not require practice appointments and can be performed at any time, during working hours or in leisure time, within a few minutes. This means that the RehaBite® training meets all requirements of modern and economic Rehabilitation medicine in TMJ therapy. The Aqualizer® Ultra is a new improved version of the Aqualizer® designed to be more comfortable to the gums than previous models. This is our best seller and will fit most adult patients’ mouths. The Ultra comes in three vertical openings (thicknesses): 2mm (low), 3-4mm, (med), and 5-6mm (high). The Aqualizer® Mini is the new improved ultra shape with smaller pads and arch size. It is used for teens and adults with small mouths. The Mini comes in three vertical openings (thicknesses): 1mm (low), 2mm, (med), and 3mm (high). Stay up- to -date with our current special offers and discount codes to get all of your Aqualizer® products at a great price!